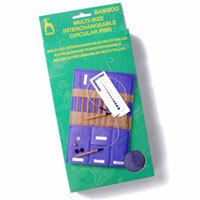 Case includes 30 parts: 9 pairs of pin shanks (3.25mm to 7 mm); 3 cable lengths for 40, 60, and 80cm circular pins; 4 colour coded adaptors; knitters gauge with cutter; 2 pairs colour coded knobsend caps. All in a luxury fabric case. The best way to create circulars for any project! Experience smooth, lightweight feel of precious Bamboo, with a warm and natural touch for easy knitting. The high precision screw thread mechanism made from top quality solid brass connects shank and cable with an easy twist to form a tight and smooth joint. Delightfully arranged in a luxury fabric case made from hand woven pure cotton, this top of the range set holds everything in one place and makes sure you've always got the right needle when you need it. Particularly useful for the more mature knitters as the stitches do not add weight to the needles, and therefore are kinder on wrists and fingers and enables knitting to once more be a pleasureable experience.